London (AFP) - British Prime Minister Theresa May accused the other 27 EU countries of lining up to oppose Britain over Brexit after Germany's Angela Merkel said the UK should have no "illusions" over the exit process. 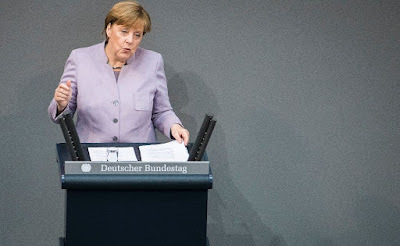 "A third-party state will not have the same rights or even superior rights to a member state," the German chancellor told parliament two days before a key summit in Brussels. "This may sound self-evident, but I have to say this clearly because some in Britain seem to have illusions on this point," she said. "That would be a waste of time." Later in the day, May accused the 27 other EU member states of lining up against Britain. "Our opponents are already seeking to disrupt those negotiations –- at the same time as 27 other European countries line up to oppose us," May told a campaign rally in Leeds, northern England. "That approach can only mean one thing -– uncertainty and instability, bringing grave risk to our growing economy with higher taxes, fewer jobs, more waste and more debt." 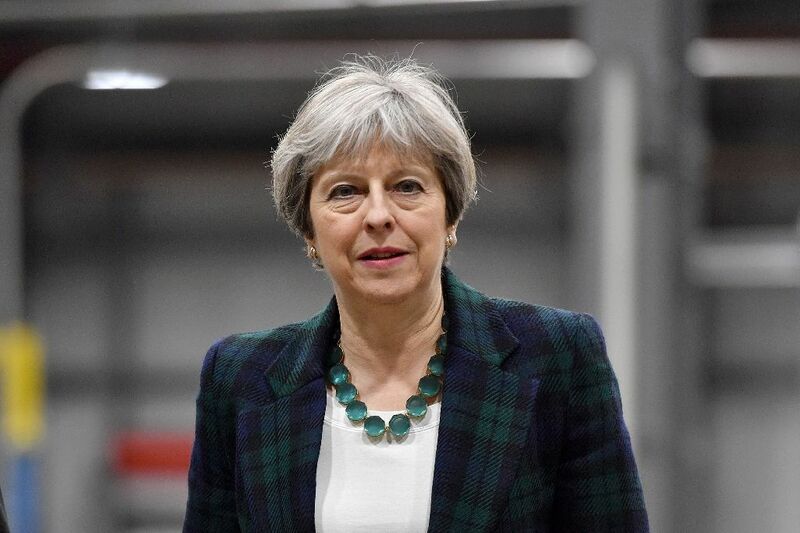 The British leader is currently campaigning after calling a snap election on June 8, hoping to shore up her mandate ahead of two years of gruelling negotiations. The leaders of the other 27 EU nations have stressed a united stance as they plan to meet Saturday to set down the bloc's "red lines" -- although the talks will not begin until June, after Britain's election. "The negotiations will be very demanding, without a doubt," said Merkel, the leader of the biggest EU economy. The EU has toughened its strategy, making new demands over financial services, immigration and the bills Britain must settle before ending its 44-year-old membership of the bloc. Britain could be required to give EU citizens permanent residency after living there for five years, in a challenge for May's Conservative government, which has vowed to limit immigration. The EU's latest draft negotiating guidelines, agreed on Monday, seek to ensure Britain does not get a better deal outside the bloc than inside. According to the document seen by AFP, the other EU countries will seek to hold Britain liable for the bloc's costs for at least a year after it leaves in 2019 -- longer than was previously proposed. Merkel said that talks from the very start must include Britain's financial obligations, including after Brexit. She said these issues must be resolved first in a "satisfactory" way before negotiations turn to Britain's future relations with the bloc -- a sequence Merkel called "irreversible". "Without progress on the many open questions regarding the exit, including the financial questions, it doesn't make sense to hold parallel talks on the details of a future relationship," she said. May, after starting the Article 50 process of leaving the EU last month, is seeking to shore up her mandate for the Brexit talks in a snap election on June 8. Polls suggest her Conservatives will return with an increased majority. 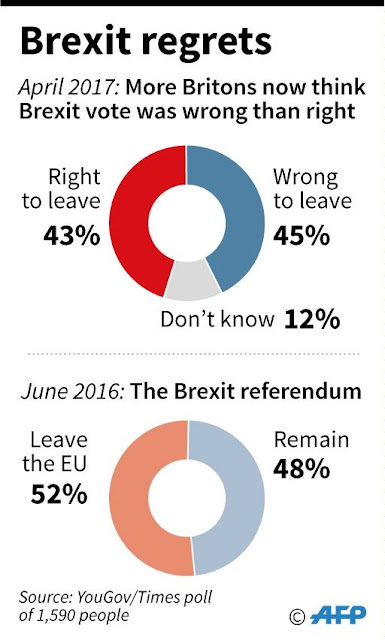 A new survey, by YouGov for The Times newspaper, meanwhile for the first time signalled more people now believe the Brexit vote was a mistake, by a 45-43 percent margin. May hosted a working dinner on Wednesday with key EU Brexit negotiators, including European Commission President Jean-Claude Juncker. EU ministers met in Luxembourg on Thursday to prepare the ground work for Saturday's meeting. "It seems that at the moment we are completely united on everything," said Maltese Vice Premier Louis Grech, whose country holds the rotating presidency of the EU. "Naturally we have to protect the EU's interests." He said a prime objective was "to ensure that we will conduct the negotiations in a spirit of unity and trust between the 27". May has committed to pulling Britain out of Europe's single market to end free movement of EU citizens into Britain. Earlier this week, a German senior finance official rejected this demand, in an interview with AFP. "What won't work is having access to the internal market without freedom of movement" for EU citizens, said Jens Spahn, state secretary at the finance ministry. "Or access for UK financial institutions to the European financial market if at the same time there is rampant deregulation in London. "You can have either one thing, or the other. These things must be clarified."